You could say the JavaJug is pretty much a metal jug with measuring lines inside. And you’d be right. But it’s not so much what the JavaJug is that’s important, it’s what it helps you do. After all, not every metal-jug-with-measuring-lines-inside is designed to be exactly the right size and shape to work specifically with the AeroPress® coffee maker. It’s a strong stable container for pressing into. You’ve got to press into something. Some mugs are too narrow, some too wide, some too brittle, some too tippy. The JavaJug is just right. No big deal there. It’s a brew jug that makes it easy to dilute more than one cup. For example, if you press two cups worth of concentrate into a mug, it can be messy to pour half into another mug before diluting them. The JavaJug lets you dilute into the same container that you press into, which also makes for a more consistent cup. Yippee. The JavaJug’s internal dilution guides are calibrated both in 8 ounce and 5 ounce increments, depending on your preference and custom. It helps you make more coffee. For optimum taste and easier pressing, press two cups into the Jug. Then press another two cups, and then dilute. Sure it’s more work, but a little exercise is good for you. It’s a serving jug for you and your guests. The spout and handle make the JavaJug perfect for serving guests. It’s not rocket surgery. It’s a elegant storage container. 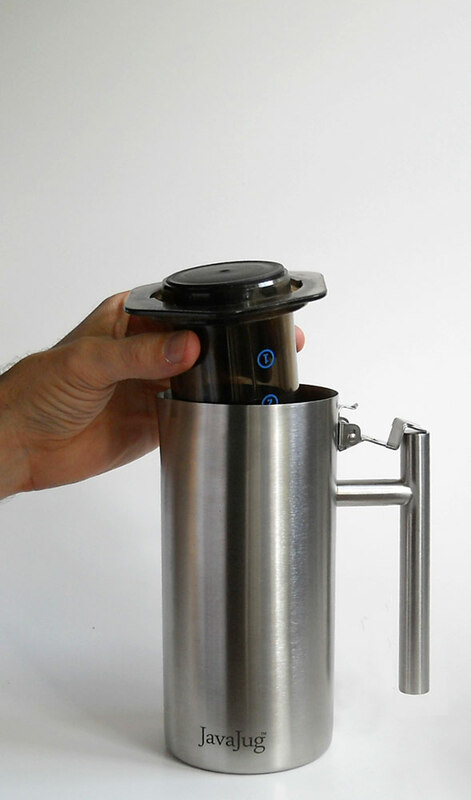 The JavaJug is designed to hold the AeroPress and its parts. It saves space because it keeps everything compactly nested together inside the Jug. 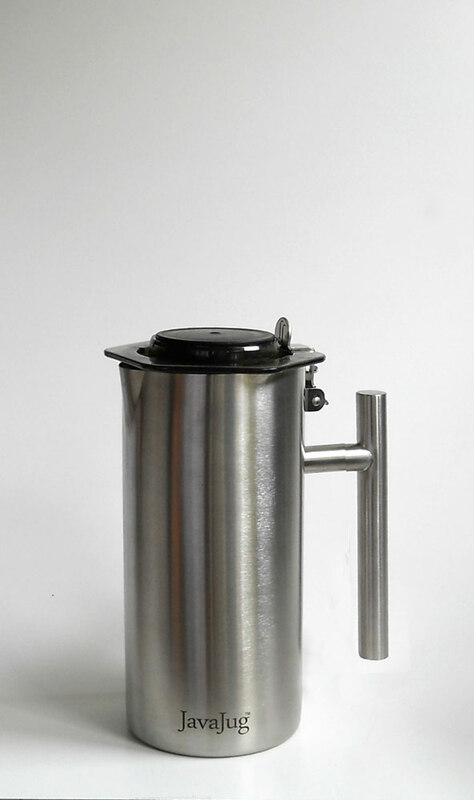 Instead of a bunch of separate parts on your countertop or in your cupboard or drawer, you’ve got a sleek stainless steel JavaJug. Hey, you could keep it in a plastic bag or a shoebox instead. Or a nylon zippered bag. Those work too. They’re just not as pretty. It keeps everything together so you don’t lose things. The AeroPress has a few different parts. It’s annoying if you lose the filter cap, because then you can’t make coffee. And you have to buy a replacement part, and wait for it to arrive. Annoying! “A place for everything, and everything in its place”. You’ve heard that, haven’t you? The JavaJug is the “place”. It’s a rugged travel case. If you’re going to take your AeroPress hiking in the Himalayas, the last thing you want is to have all the bits falling out in your backpack. Sure, there are worse things. But who needs more annoyance? 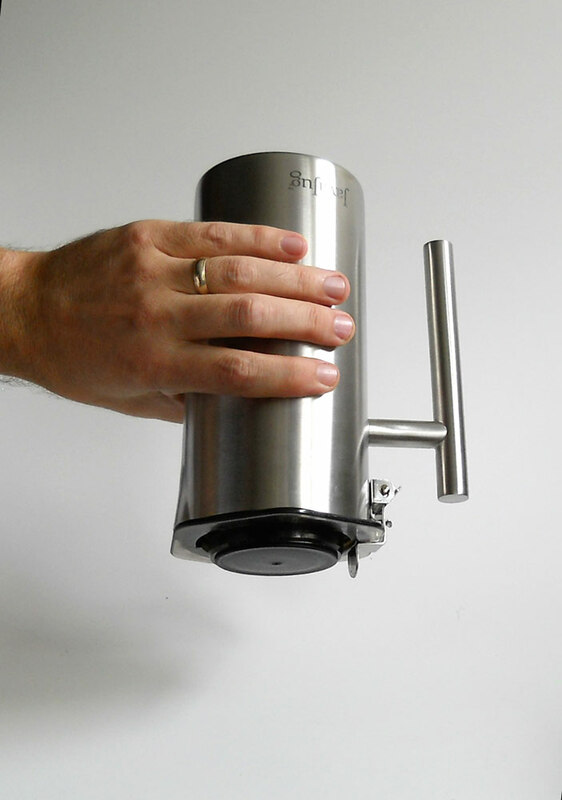 The JavaJug has a specially engineered metal tab to hold the AeroPress and its parts inside, even when you hold it upside down. Like everything else about the JavaJug, it’s a simple design. So simple that it took over a hundred design iterations to make it work properly and still be feasible to manufacture. Did we mention rugged? We did? Well it is. We smacked it (pretty hard) with a small sledgehammer to test it out. The JavaJug didn’t bend. But it did get a little scratch. It’s light weight too. It weighs 312 grams, which is about .68 pounds. Maybe that’s a bit of a stretch. It’s not an electric kettle. But you can boil water in it over a camp stove or even an open fire. So that makes it a kettle, right? Note: PLEASE remember to remove your foam insulating JavaJacket sleeve (if you have one) from the JavaJug before heating it! Otherwise the JavaJacket could burn, and that would be bad. Over a controlled flame like a camp stove, you can use the Jug’s handle without it getting too hot. Over an open fire however, your mileage may vary. Let us know. The Jug is easy to clean because there are no seams in it. The Jug and spout are formed from a single piece. Nifty. Not bad for a simple metal-jug-with-measuring-lines-inside, right? But if you don’t need to do any of the things the JavaJug does, you don’t need to buy one. Give the money to charity, or just buy some more coffee beans. (Arabica is best, but you know that). You can’t get back the time you took to read this, but hopefully it hasn’t been too much of a hardship. Actually it’s surprising you’d even read this far. Maybe somebody you know might like a JavaJug. 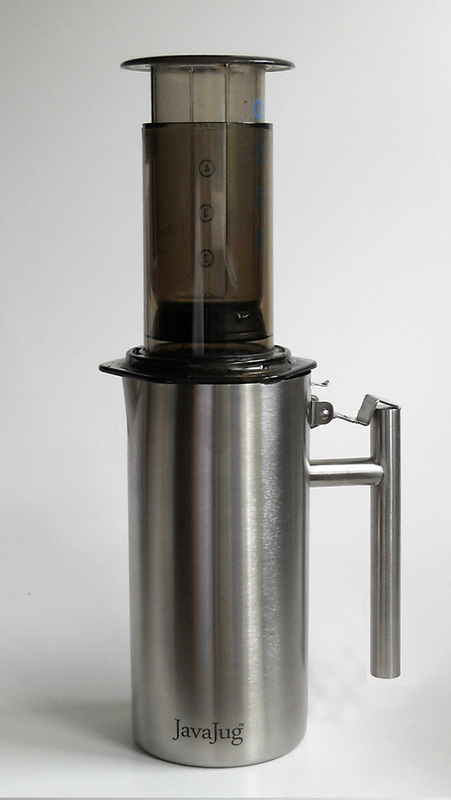 We think it could make a nice present for an AeroPress owner. But we’re biased. Think for yourself. Then buy one.